This past month was all kinds of bad for working out. Yes I squeezed ten workouts in and yes I made a point of taking the stairs instead of elevators but I could have done much more. Between the weather, stress at work and a basic major project hangover it was my not my most stellar month ever. When I was there it was fantastic and I was amazed at how my body keeps changing. My workout clothes that used to be snug are loose or too big entirely. I'm at the point that I may have to adjust the band on my heart rate monitor again cause it's a little slack when I'm working out as of late. And I have gone from actively avoiding the elliptical machine to spending forty minutes or more on it whenever I hop on that bad boy. I'm within a half pound of one my bucket list items--lose forty pounds. That may or may not happen this week but you know what I'm ok with that. The weight doesn't have to pour off of me each week. I'm not gaining weight and I'm losing at least five pounds each month which is what brings us to now. It has felt like forever since I have lost more than five pounds and kept it off so this is a new experience for me. While other people are noticing the weight loss when they see me for me I'm not seeing major changes anywhere except my belly which is shrinking, it's not flat but shrinking. I've opted to upgrade the fitness watch as I think I mentioned in a previous post so it's just a matter of waiting until my plum Fitbit Charge HR is delivered. As I finished my second bottle of water this morning I was amazed at my shift from water is disgusting to that is pretty much all I drink especially when I have my Mio or Minute Maid drops. I'm not overeating and I'm not overindulging when I do have a cookie or brownie or something at work. I'm committed to doing the food thing healthy now and can eyeball a good serving size and do check calories on things I'm buying. I am by default counting calories because of my meal plan but I've been surprised about how not hungry I am eating a more balanced diet than the bored and ridiculous amount of food I was eating before. And as my trainer has noted I'm still eating foods I like I'm just not making them in a way that would kill me and I'm not eating them to excess. Time for a snack then beef kabobs and a baked potato for dinner tonight. Gotta stick with it. I will be pinup cute dang it. More than that though I'm happy that I am not continuing to allow my body to be out of control just because I feel helpless to change it. It's changing, slowly but surely. I actually slid into a pair of my old size 18 Lane Bryant jeans on Friday and they were comfortable with a little give. My other jeans are way too big now and if I don't wear a belt they would be in super saggy mode. I haven't put on my dress pants as of late cause it's really freaking cold. But I tend to be in at least one size smaller dress pants than jeans so whenever I brave the size 16s to see if they fit I will let you know. I'm worried they will be too big. The pants I loved from LB used to have belt loops, these do not which is just stupid. How is the working it out going in your direction? Hey, congrats on your weight loss and a little tip I give my clients. Those clothes you can no longer fit in but are too large to be taken in, you need to get rid of them. I had a client I got her from and size 18 to a size 10 and she gradually started gaining weight. She kept telling herself she will stop at a 14, then 16 and eventually she was fitting in her old clothes again. If you don't have clothes to wear could be a way for stopping you from regaining. Visiting from the Friday linkup. Good tip. I'm probably smaller than I think I am but I haven't attempted to purge the closet. You're right that even having them in the house can give you an imagined "buffer zone." I don't have a target size in mind even though desired weight loss was part of this plan. Once I hit there I'm going to work with the trainer on maintenance before we part ways. I'm going to miss her though she super rocks and has kept me motivated enough to make it through the slow weeks without feeling defeated. Thanks for stopping by. Get it get it girl! I'm so proud of your progress! 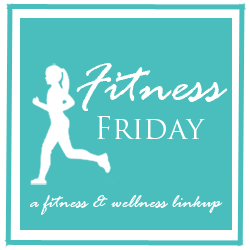 Thanks for being apart of the #FitnessFriday movement! Thanks, I'm glad that it finally all came together instead of either the working out OR the food being on point. Turns out it's not as hard as I was making it out to be.